Middleton Primary Center in Huntington Park, California is committed to promoting healthy food and beverages, appropriate snack-time foods, and engaging parents. Principal Sanchez shared that she and her staff used to only meet to discuss academic matters, but now she and her staff organize trainings around health, nutrition and healthy lifestyles. Ms. Sanchez and her staff have realized they have a big impact on children’s lives and started a campaign to educate students, teachers and parents about healthy foods. Every Monday, the principal and a parent liaison lead parent trainings about a variety of topics including transitioning away from serving food and beverages with added sugars and My Plate . Principal Sanchez is also encouraging parents to adopt healthier lifestyles during her monthly “Chat and Craft” meetings. During these meetings, parents have the opportunity to discuss an informal topic with the principal while making a seasonal craft and enjoying a small snack. Two parents have since volunteered to lead the snack demonstration and are now taking a leadership role within their school community to promote healthy eating. Celebrations at Angeles Mesa YWCA in Los Angeles, California were filled with sweets, candy and sugar-sweetened beverages. 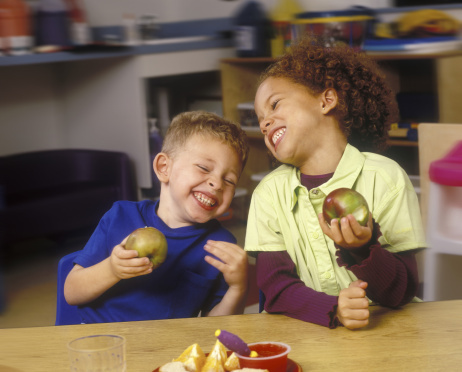 Staff and children were eating unhealthy foods during mealtimes. Children were also not getting enough exercise. Head Teacher, Colleen Rodriguez, decided to lead the center in change. Easy-to-follow tip sheets from MyPlate are perfect to post on the refrigerator or use as a take-home for parents. Topics include: Kid-Friendly Veggies and Fruits, Eating Better on a Budget, Cut Back on Kids’ Sweet Treats and many more. Also available in Spanish.